It was only after uploading these photos that I realised they make me look as if I have extra arms - sozza. Blame the best lighting in the house being in front of a mirror, and the fact that I'm still trying to get this cringey #ootd thing down. 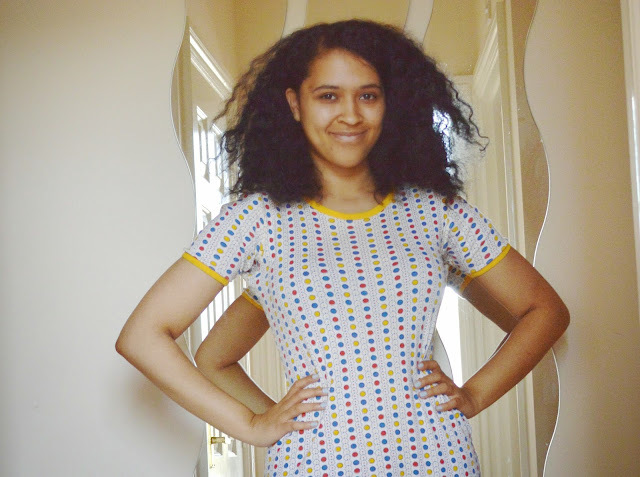 Anyhow, let's talk about this 80s print maxi t-shirt dress. Far brighter in person that it looks on camera, it caught my eye when setting up our East London Vintage Kilo Sale so I made sure to put it it aside before any other customers could bag it. I'm so glad I did - there's something quite Lazy Oaf about it, basic in cut but with a loud print, topped off by the mega on-trend ringer trim. I'm still considering cutting it down into t shirt or mini dress length, but there's something so appealingly low-maintenace about throwing on a long summer dress and being completely good to go. Wow, I love this, and you totally rock it!